Lots of Mountaineers ride bicycles -- sometimes for fun and sometimes for transportation. 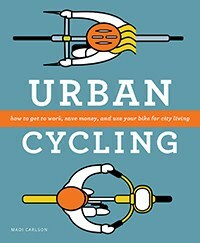 If you're thinking about the later, the new book, Urban Cycling, from Mountaineers Books is a great place to start. While I’m a fiercely proud born and bred frugalist, saving money is not one of my main motivators for commuting by bike. It might even be last on my list, with happiness, greenness, efficiency, and health vying for first place, but it’s often one of the first questions people considering a bike commute ask: how much money will I save? Cars are anything but cheap. From the 2014 AAA “Your Driving Costs” study, cost per mile and per year based on fuel, maintenance, tires, insurance, license, registration, taxes, depreciation, and auto loan finance charges, as well as an average of 15,000 miles per year, an average sedan costs 59.2 cents per mile, or $8,876 per year. In The Basics and Benefits of Bicycle Commuting, car-free author and bicycle commuting advocate Chris Balish calls the bicycle the most cost-efficient mode of human transport ever devised. Walking is the only form of transportation that's cheaper, but he points out that if you factor in the time saved by covering ground more quickly, bicycling can be considered the cheaper choice. The awesome efficiency of the bicycle makes it difficult to calculate the per-mile cost of a bicycle. Most figures calculate savings of 5-15 cents per mile and net savings when factoring in canceled gym memberships or healthcare savings from giving up a sedentary lifestyle. Using 10 cents per mile as our bike cost versus the IRS 2014 Standard Mileage Rate for business miles of 56 cents per mile leaves us with 46 cents saved per mile when you choose bike over car—not including tolls or parking fees. If your work is two miles from home, that quickly adds up to $9.20 per week—and that’s using a fairly modest number, though most bicycle commutes are five miles or less.